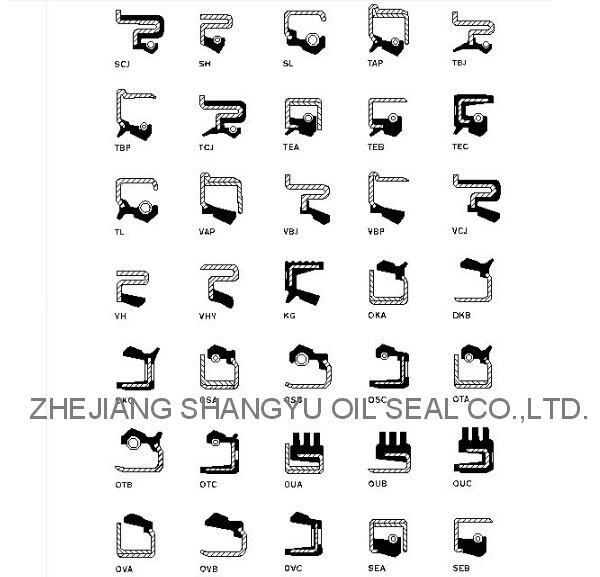 Oil Seals are a good resource for any application where foreign media such as oil, grease and dust are concerns. A variety of Lip, Case and Spring materials are available for your review while you make your seal selection. R-Nitrile Buna-N 70 durometer compound is the standard material for our seals and is recommended for a majority of common applications. Nitrile lip seals work well within the temperature range of -65'F to 250'F and provide compatibility with water and most common mineral oil and greases. P-Polyacrylate compounds are recommended for higher temperature applications, ranging from -30'F to 300'F They also work well with mineral oils, e.p. additives and greases. However, they offer poor sealing in dry running conditions and cost more than Nitrile. S-Silicone compounds offer the widest range of normal operating temperatures ranging from -90'F to 340'E However, they do not perform well in dry running conditions, and should not be used with EP compounds and oxidized oils. V-Viton¨ compounds are premium lip materials offering the widest temperature range and chemical resistance. Viton¨ will handle temperatures from -40'F to over 400'F (-40'C to over 240'C). Viton¨ will resist most special lubricants and chemicals that can destroy Nitrile, Polyacrylates and Silicones. Viton¨ is extremely resistant to abrasion and provides superior wear performance. Viton¨ works in dry running applications, but only for intermittent periods. Graphite is available as an additive to any compound. Normally graphite is added at a 3% factor to aid in lubricity (If the lip material is something other than Nitrile standard, the letter indicating the material will immediately follow the part number and precede the lip and case designation). Unless otherwise noted, the cases of springs for our seal products are produced from carbon steel. In applications where corrosion resistance is important, either case or spring or both can be produced from stainless steel. In addition, rubber coated seals can provide the best resistance to corrosive environments in the most economical design. HYPALON¨ coating is an O.D. sealant which is available on any metal case design by customer request. The following tables identify the most common lip and case designs. Additional, more complex designs are available for special applications, however, the lip and case designs below represent those which will fill the needs of most seal requirements.